Yesterday (uncharacteristically) we decided to take a hike before breakfast. 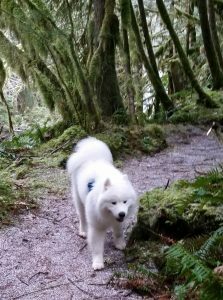 The ‘uncharacteristic’ part I refer to was ‘before breakfast.’ Up near the Canadian border we often go hiking on a familiar trail with our dog leading the way. Rama is an excellent trail dog, unless other dogs or people are around. Then he is a run-away, nut job, ever up for a romp with others, a friendly chat, or simply to follow anyone while leaving the ones who feed him behind. The day was set to be very hot, so getting out ahead of the heat was what drove us up the hill before taking in sustenance. And being out so early meant we also succeeded in avoiding people and doggies, a complete win. While hiking I noticed how often my mind, just like my dog, runs off with me. Then in a moment my attention is captured by the way the morning light is touching and illuminating the broken trunk of a tree that has upended itself into the river below. The beauty of it touches me wordlessly. I resolve to be still, a wordless observer of the woods, but before long I am planning a project like this one. I will write about “Forest Bathing”, and hold forth with data about how the aromas given off by trees are as healthy for us as the oxygen they produce in such abundance. Ah, the mind – so quick. At the next lookout spot over our beloved river we note to one another the milky-white color of the water, and tussle with each other about the look and definition of run-off, and snow-melt. 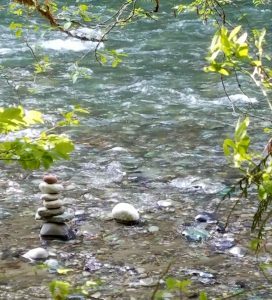 The sandy beach below has become more rocky than last we saw it, my hand-carved wooden offerings are still in place, someone has chain-sawed off a small piece of a downed tree. In this way my mind creates a world, populated by ideas, beliefs, musings, projects, and I become identified with it. ‘I am’ becomes, I am the hiker, the dog-lover, the carver, the notice-er, the river viewer, the one who comes and goes. All the while a stillness is present and in brief glimpses I apprehend it, and even fall under its sway now and then. I am caught in stillness, even as my ears hear the river, caught in illumination even as the morning light touches the mossy tree ahead, held in the mystery even while swimming in the mist of the mind.